Pradhaman is usually prepared with lentils, or fruit like banana, mango and ripe jackfruit. This chakka pradaman is a dish I make for naivedhyam for Vishu. In tirnelveli dist some villages are near to kerala border.Since our both villages( Me & my husband) are near to kerala border.. So most of the food related to kerala & tirnelveli combination.Pradhaman is one of the dish often made in My family.. The payasams or pradhamans prepared out of jaggery, coconut milk and fruits like jackfruit, bananas and Palada Pradhaman, which is made of rice, sugar, and dried rice flakes or ada ,rice adais require elaborate procedures which are simplified a lot. To prepare this chakka pradhman , it’s necessary to use only ripe jackfruit. 1. Jack fruit pieces- 10. 3.coconut - 1( big) . 5. Ghee - 2 tablespoons. 1.Cut the jack fruit and NendramPazham and cook for about 10 minutes. Allow to cool. In the meanwhile, dissolve the jaggery in 1cup of water and melt it, filter and continue to heat in low fire. 2.Now mash the cooked jack fruit pieces into a paste in a mixer and saute it in 1 spoon of ghee in a thick bottomed vessel, in which the payasam is to be made. Add the liquid jaggery to it and continue to cook it in low flame till both items blend together into a semi solid consistency. Put off the fire. 3.Grate the coconut and extract the milk by adding 1 cup of water in a mixer and keep aside . Add 1and a 1/2 cups of water to the gratings (from which milk has already been extracted) and extract coconut milk again and keep this diluted coconut milk separately. 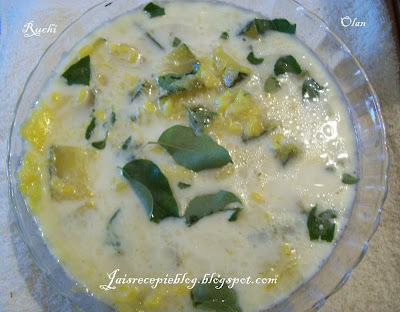 4.Add the second extract of coconut milk first, stir well , and bring to a boil on low fire. Now turn off the heat and add the first concentrate milk. 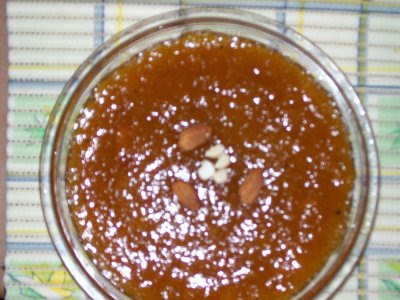 Note that after adding the first concentrate, the payasam should not be heated. 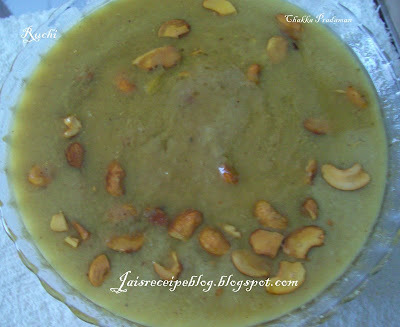 5.Heat the remaining ghee in a frying pan, fry the cashews and cardamom powder and add to the payasam for garnishing. The jack fruit payasam is ready to be served for the feast. 1.Cook the seppankilangu and keep aside. Grate coconut Squeeze out 1/4cup of the milk from the coconut without adding water. Take one more cup of milk from the coconut. 2. Cook the vegetables and moongdal in water. 3. Add enough salt and the green chillies. 4. When it is done, Then add seppankilangu with 1cup coconut milk and boil. 5. When it thickens well, add 1/4cup coconut milk. 7. 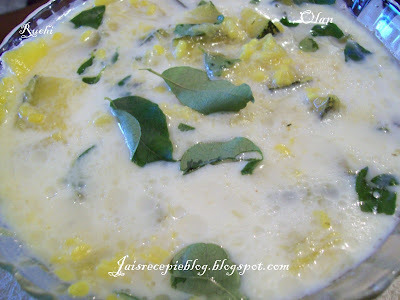 Add 1tbs coconut oil and the curry leaves and mix well. All the dishes look so mouth-watering. Never used jackfruit in my cooking. Halwa sounds great. Next time I find jackfruit I am going to try this. Thanks for sharing Jaishree! Both dishes looks yummy jaishree! Jack fruit halwa and kheer are mouthwatering dishes. The true recipe for olan makes me crave for it. Happy New year dear. Akka, they all look soooo delicious. am drooling here. Wow, i love the halwa..That looks gorgeous..Makes me to mouth water now..Delicious recipies..
Chakka varatti is my all time favorite Jaishree. My patti makes during this vishu season. Looks really mouth watering..
How are you? Been a long time since I read you. I bought chakka this weekend to make chakka pradhaman for my better half's birthday this month. first time here thru preethis.u so made me want to eat olan now.